Here’s a good news for all the Xbox geeks and freaks. Finnish handset major Nokia along with Microsoft Windows Hotmail has brought out a new contest wherein a customer who activates Windows Live Hotmail on their Nokia phone might just end up in getting a Xbox in their inbox. Sounds confusing?? 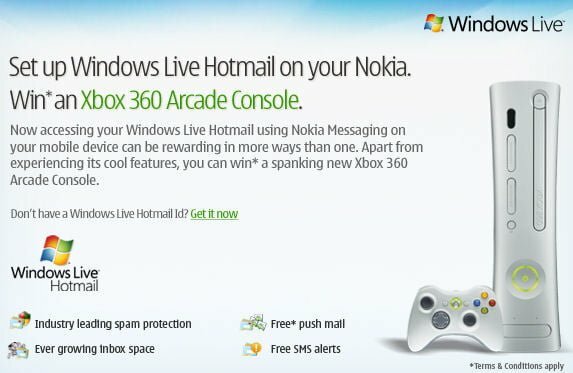 Well Windows Live Hotmail and Nokia in a strategic tie up is offering customers a chance of winning a Xbox 360 every week. Game on people. Get your thumbs up and fingers moving. 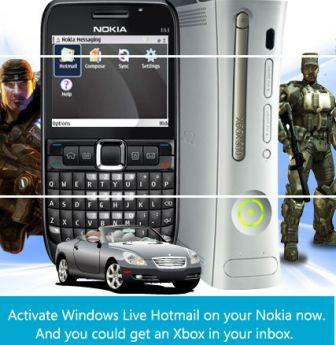 Activate Windows Live Hotmail on your Nokia phone through Nokia Messaging Service and you stand a chance to win an Xbox 360 every week. I have already configured hotmail in My Nokia E63 (Nokia Messaging) but i didn’t get any xbox…..
Hahahahaha.. but dude im not Bill Gates.. hota to try karta dena ka! !